Our Holy Father Stefan was born in the village of Kuta in the diocese of Niksic, of poor but devout parents named Radivoje and Marija. From his early years he distinguished himself by his meekness, humility and unpretentiousness. And when, as a young man, his keen mind wrestled with the burning questions concerning the meaning of life and the world, especially the purpose of man’s being, he left his parental home and went to the monastery Moraca whose church is dedicated to the Dormition of the Mother of God. As a novice, young Stefan spent long years in ascetic struggles in the Moraca monastery, diligently fulfilling his obedience with humility and selflessly taking upon himself most difficult tasks. His soul was yearning for the heavens. Sweet-scented virtues abounded in him, each one perfecting the other, one virtue developing in the exercise of another. And, in consequence, the fervent Stephan was blessed to receive angelic monastic tonsure. Zealous and fiery in virtues, clear in understanding, he was ordained to the rank of hierodeacon in Moraca monastery, and soon after he was ordained a hieromonk. Later he was appointed abbot at the same monastery. But that was the time (seventeenth century) when the Turks and the surrounding Albanians often attacked the monastery Moraca. They usually arrived from Kolasin, ransacking the monastery and assaulting the monks. The Venerable father Stefan, while still only a novice, could withstand these attacks and abuse as he was not particularly notable among the brethren. But as a hieromonk priest he distinguished himself by serving diligently and faithfully at the altar of God, preaching the Gospel and zealously guiding his flock as the “good shepherd,” therefore attracting attention and hatred in equal measure by the adversary of Christ. The chief enemy of mankind Satan cunningly used this situation and worked in a variety of ways to avert Saint Stefan from his life of ascetic struggle and holy deeds by repeated Turkish intimidation and violence. And when the rage of infidels became unbearable, the monastery brethren were forced into retreating to the surrounding caves. During those assaults, the young hieromonk Stephan was always among the last to retreat from the monastery. But when the wrath of Turks fell upon him, threatening to murder him, he decided to withdraw. He entrusted the monastery to the brethren who elected a new abbot from among themselves. The saint went from the monastery Moraca to a secluded mountainous region called Trmanje (Rovci), about five hours’ walk from the monastery. There he dwelled in a small cave. He made for himself a cell in this cave whose remains called Celiste (a monk’s cell) are still visible today. When Turks from the city of Kolasin found out that saint Stefan had left the monastery Moraca, they quickly organized a chase hoping to find him in the mountains and slaughter him. To this end they sent many armed bands all over the area. But the merciful Lord, by whose permission the venerable Stephan had suffered from the Turks in the monastery, now saved His servant in the desolate area from their murderous hands. For the shepherds from the surrounding mountain villages, who kept their sheep there, brought crusts of dry bread to the hermit and kept watch on the Turks during the day; and at night a thick fog would descend on the mountains, making the entire area impenetrable. The saint spent seven years in a dense forest, practicing his monastic rule and so purifying his mind, soul and heart from the passions, from sin, from death, from the devil. In this way he became victorious over sins and passions, over demises and over devils. But Satan, in order to defat and subdue him, resorted to his usual devices and trickery. The devil fought Stefan by afflicting him with countless visions of horrors, visions of sensual images, full of dirty pleasures. The desert, especially at night, echoed with horrifying roars and obscene songs. But all this could neither scare nor deter the holy man from his journey to attain the heavens, to reach the Kingdom of God. He knew that the Lord Christ is incomparably stronger than all demonic illusion, horrors, fantasies, and apparitions together. Firmly clinging to the all-victorious Lord by faith, prayer, fasting and every other holy virtue, he continually triumphed over all temptations and all the assaults of the devil. After having spent seven years in Trmanje, Saint Stefan abandoned his cave and moved to the region of Skenderija, which was ruled by the tribe of Piperi. He took abode in a desolate place above the village of Crnci (Blacks). There, by a spring of water, he erected a small church in honor of the Nativity of the Mother of God. He also built a cell for himself and soon a few monks gathered around him. (According to one account, the saint came to Piperi around 1660.) The tribal prince Ananija Lalic endowed a piece of land to the holy ascetic, so that the monks could support themselves. The tribe of Piperi persistently refused to recognize the Turkish authorities from the neighboring Turkish fortress in Spuzh and frequently fought them. Piperi only recognized authority of the Serbian Orthodox rulers (Petrovic family) from Cetinje. The Venerable Stephan spent thirty-seven years in the Piperi monastic family, having developed a diverse pastoral activity. He laboured tirelessly among the people, teaching them the truths of the Orthodox faith. The saint saw into the hearts of people, and as a spiritual physician, he healed their infirmities of soul and body through prayer and by his grace-filled words. He repeatedly called people to repentance, because repentance is an all-powerful cure from every sin, from every iniquity, from every evil attack, from every demon. Because of all his toils the people loved him as a father and a God-sent teacher. Having spent his life in God-pleasing ascetic struggles, our Venerable father Stefan reposed in the Lord on May 20, 1697. He was buried in his monastic family, near the altar on the south side of the church. Four years after the interment, in 1701, a strange light began to appear at his grave site, often emanating from within the grave. In addition to this, some monks and laity occasionally saw small flames fall on the tomb from the sky and there burn brightly for a long time. For that reason, the monks had decided to summon presbyter Lainovic (whose Christian name is not mentioned) from Podgorica to oversee the opening of the grave of the Saint. After the Divine Liturgy and prayers they opened the tomb, and the relics of the Righteous Stefan were uncovered, exuding a fragrant myrrh, from which many received healing. The presbyter of Podgorica took the relics of the Venerable Father into his own hands and accompanied by the monks, who were chanting hymns with many tears, transferred the relics to the monastery church of the Holy Archangels. 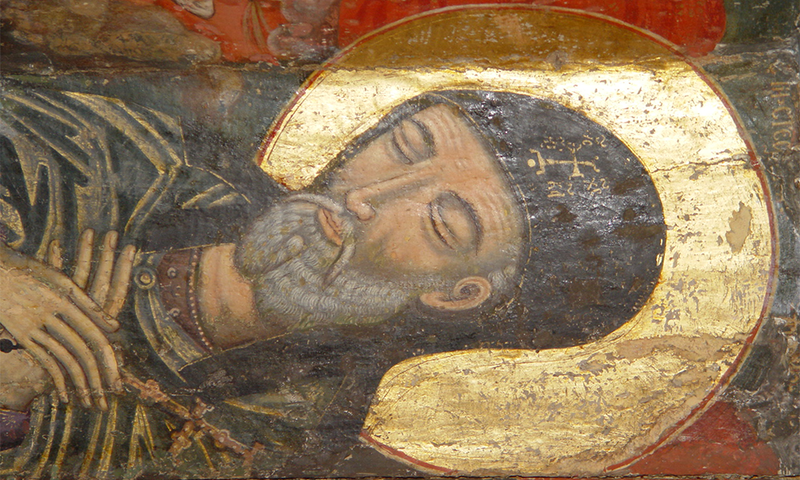 At the news of the glorification of Saint Stefan’s body, countless people streamed to the monastery to bow down before the holy relics and venerate them, and entreat him in prayer to fulfil their spiritual or physical needs, to ask for the intercession and protection in life’s many sorrows and pains. Not only Orthodox Christians, but also Albanians and Turks came in great numbers. From his relics occurred many miracles of healing. The Saint helped the Orthodox Christians in skirmishes against the Turks. On several occasions during these frequent conflicts people from the tribe of Piper wanted to move the relics of the Venerable Stefan somewhere safe, but the Saint prevented this. And so until today the relics of our Venerable father Stefan repose and perform miracles in the Holy Monastery of Piperi. Through the prayers and supplications of this great Saint Stefan may Lord have mercy and save us all. Amen.